April 25th, 2017 | Children & Pets, Lifestyle, Moving Tips. Whether you purchased a second property to spend more time in your favorite city or to reap the health benefits of living near the ocean, creating a happy home far away from your permanent residence can be complicated. Unlike your primary family home, your vacation home may have seasonal restrictions, require a lot of planning to use, or come pre-furnished. These factors can make it difficult to decide what you should bring with you when you move in. In this blog, we list five essential guidelines for moving into your new getaway. 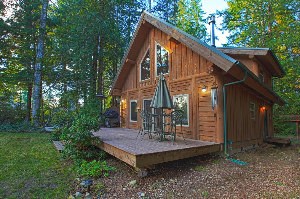 Many vacation homes have spent time as rental properties for tourists and seasonal visitors. If your second property has a rental history, it may come with many of the current furnishings. Your real estate agent should be able to give you a list of what’s staying in the house. After you purchase the property but before your big move, visit the home and walk through it again. Assess the condition, type, and look of the current furnishings. Determine what you’ll keep and what you’ll get rid of. This step can help you determine what you should pack up and bring to your second home. For example, if you decide to donate the master bedroom’s bed and dresser, you’ll need a replacement for your own use. Keep track of what stays and what goes. Once you begin packing, use what you know about the second property to create a list of items you plan to permanently move to your new home. Some popular locations for second homes may have more limited resources than your primary living address. For example, rural country settings and waterfront properties may rely on generators for power and wells for water. These areas may also have limited cell service and internet availability. Before you move, determine which year-round and seasonal utilities your property has. For instance, in colder climates, your property’s water supply may need to be winterized, making the home unusable for a portion of the year. Make arrangements to start your utilities before you move. This step ensures that you have water, power, WiFi, and any other utilities you need to start enjoying your vacation home. Some vacation areas have plenty of stores, restaurants, and local entertainment available. However, other popular areas are quite a distance from grocery stores and pharmacies. During your visit that we discussed in section one, drive around the city or town where your second home is located. Use what you observe to determine if you should bring food, entertainment, and household essentials like hand soap and toilet paper with you. You may also have the option of having your groceries delivered to your home if your property is in a somewhat remote area with a larger neighboring city. On a normal trip to your vacation home, you should be able to transport any equipment you need yourself. For example, you should have the required vehicle and accessories to tow a boat, bring along your family’s bikes, and so on. However, during your initial move to this new property, you will likely have more than what fits in your RV or pickup truck. Work with a professional moving company to ensure that you can move all your permanent second home belongings safely and efficiently. If your second home is in a rural or limited-access area, check with your prospective movers to ensure that they serve the area you’re moving to. As you prepare to move into your vacation home, make a list of what you need to do in your primary residence. If you plan to mostly use your second home on the weekends, you may simply need to tidy up and take care of any bills or maintenance tasks that could come up while you’re away. If you plan to spend the entire season at your vacation home, take steps to prepare your primary residence for vacancy. Eat or get rid of any perishable foods, consider turning off your water to limit the risk of plumbing emergencies, and find a house sitter if you have plants that will need watering while you’re away. Double check that you’re including everything you might need from your primary residence if you plan to stay in your vacation home for a long period of time, like your electronics chargers, any business items, and so on. Whether your new home awaits you on the peaceful slopes of a mountain range or in the heart of a bustling city, use these tips to streamline your first move to your vacation home.